The most valuable social responsibility project of Çelebi Ground Handling & Çelebi Aviation Holding aiming to provide the qualified human resources to the civil aviation sector. 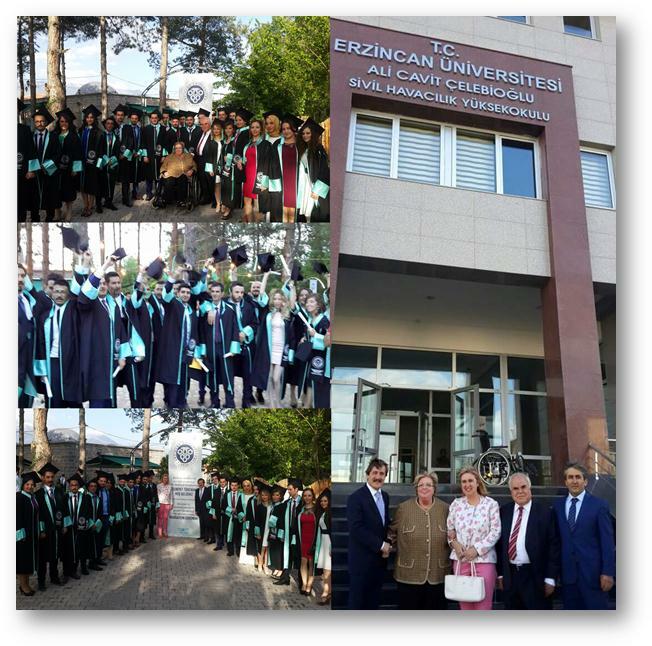 The most valuable social responsibility project of Çelebi Ground Handling & Çelebi Aviation Holding aiming to provide the qualified human resources to the civil aviation sector; Erzincan University Ali Cavit Çelebioğlu Civil Aviation School’s first graduates received their diplomes during a ceremony held on 29.5.2015 in Erzincan. Ms. Canan Çelebioğlu and her mother, the honorable invitee for Çelebi Ground Handling; Mrs. Engin Çelebioğlu attended to the ceremony, as well as the Erzincan Governor and Erzincan Mayor. Families of the students also joined to the ceremony. The first 4 students; with high degrees have been awarded by the Company. Tuğçe Uyav , the honors student added her name on the graduation index, and she leaded the oath taking ceremony; besdes; all new graduates have been interviewed by the HQ HR responsibile and the graduats have recieved job offers at different Çelebi Ground Handling stations in Turkey.